Most companies state that less than 50% of their product launches were not successful. 70% of companies mention that their innovation processes are manual. 67% say they are working on the wrong products and features - The reasons are many. 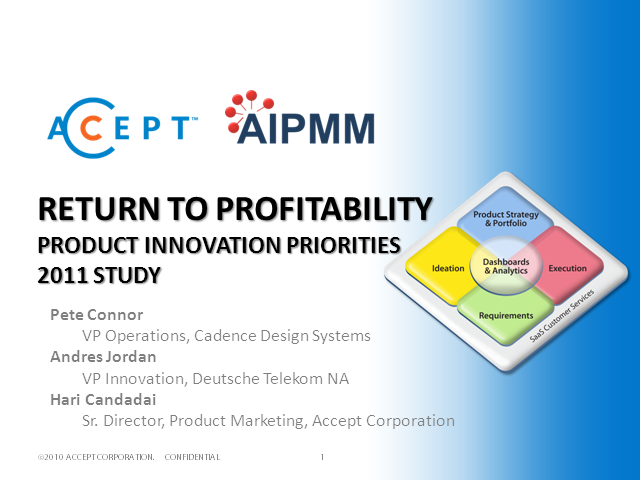 Accept Corporation & AIPMM conducted a joint study in September to determine key strategies and approaches companies are planning to achieve their innovation goals in the coming year. Over 280 executives representing product management, marketing and development across major industries and geographies shared their top innovation management priorities and challenges for 2011. Join Pete Connor, VP of Operations, Cadence Design Systems; Andres Jordan, VP of Innovation, Deutsche Telekom North America; and Hari Candadai, Sr. Director Product Marketing, Accept Corporation on November 17th as they discuss key study findings along with best practices and recommendations on how to make innovation a key competitive weapon in 2011.